Choose your own adventures… seats that act like roller coasters… VR… these are just some of the ways cinemas, and streaming services such as Netflix, are tempting movie-lovers to sample their wares – and they only have themselves to blame. The competition between Netflix and the big screen is well documented and fierce. The competition between rival streaming sites is even fiercer, with oodles of money being spent on original programming. This rivalry brings with it a byproduct that – on paper – should be a boon to movie watchers, and that's innovation. Netflix’s biggest innovation is actually itself. The all-you-can-eat way of watching movies on a subscription basis wasn’t started by Netflix – that accolade goes to Hong Kong start-up iTV – but Netflix is now the best-known such service. The funny thing is, Netflix didn’t actually know what to do with its service at the beginning. In what turned out to be a near-disastrous decision, Reed Hastings decided to spin-off the streaming service from what was, at the time, Netflix’s thriving DVD rental-by-post division. The streaming part was to be called Netflix, the rental part Qwikster. This confused the hell out of everybody and pushed shares down, and the decision was reversed just weeks later. Amid this chaos, however, it became clear the future of Netflix wasn’t in old media, but in the innovation of streaming. It was just that people weren’t quite ready for it yet. In cinema land, meanwhile, things have actually been relatively stable and, despite the fear that streaming is eating into profits, box-office returns are still very strong. But what works on the big screen is changing. Movies based on original scripts, and with a relatively modest budget, are being shunned in favor of familiar material, whether that be superheroes or Star Wars. Fewer chances are being taken with blockbusters. We're seeing much more innovation with lower-budget movies in categories that don’t need huge FX budgets, namely horror. Get Out and Hereditary prove you can have huge success with brilliant, scary stories; IT proved you can have even more success if the name Stephen King is attached. Original big-budget fare hasn’t disappeared, however, it’s merely shifted to streaming. Annihilation, The Cloverfield Paradox, Bright… these are all Netflix successes that have found a place through streaming. But that’s not the only link: they're all sci-fi themed, and the reason why Netflix is going big on sci-fi is because it because it knows its subscribers like it – and that's because it houses the data of everything its viewers have watched, all the way down to completion rates, and the number of times a movie was paused. Catering its movie selection to what its viewers want may not sound like an innovation in itself, but the computational power it uses to do this certainly is. But the big screen is fighting back, even if not everything is working. Trying to ape the Netflix subscription system, for example, seems to have met with mixed success on the big screen. In the UK, Cineworld’s all-you-can-eat subscription model has been deemed a success, but this is because it's been created by those who own the cinemas. MoviePass in the US tried a similar thing, but it's had to pare back its (frankly fantastic) all-you-can-eat option, until it’s hardly worth trying out. We're seeing the real innovation in the screens themselves, however. IMAX is the poster boy for cinema-going experiences, and many a filmmaker is adopting this format for their movies. Chris Nolan shot Dunkirk in the 70mm IMAX format, and this has sparked a resurgence in making movies for the really big screen. Couple this with audio innovations such as Dolby Atmos, and there's a now a real audiovisual draw to encourage people to choose the cinema over watching a movie on a smartphone. More recently Cineworld has been testing an innovation called ScreenX, where a movie isn’t just projected on a screen in front of view, but on the sides, too. This planetarium-style way of projecting movies feels more gimmick than innovative, but again, it’s something you don’t get in the home. Something you definitely don’t get in the home (although having a two-year-old running around while you're trying to watch a film sometimes feels like it), is 4DX. This isn’t new as such, but it seems to be growing in stature as a cinema-going ‘experience’. An invention of Cineworld's partner CJ 4DPLEX, the idea here is that you watch a movie by stimulating the five senses. Using special effects such as, artificial wind, fog and rain, you get a sensory experience that reflects what's on the screen. Oh, and the seats move. A lot. TechRadar’s Gareth Beavis loved the immersive nature of it, but also it described it as feeling like "you are getting punched in the head". Aside from pushing the movie-watching experience to the extreme, many cinemas are now pushing themselves as cultural hubs. Alongside screening movies, there's now a trend to livestream live theater productions and gigs. The idea is simple: get people in the seats for a relatively cheaper price than the live events themselves, and reach a bigger audience. Netflix has trialled pushing its content on the big screen – it has a VR app that allows you to watch its movies on a 100-inch screen, in the comfort of your home with a VR headset strapped to your face. Innovation, yes, but it’s already something that feels like gimmickry. Netflix's VR approach was designed to make it feel like you were watching a movie in your living room – while you were in your living room. Where Netflix has found a little more success is with younger audiences, in the form of its 'choose your own adventure' shows; using your remote, you can choose where an episode of Puss’n’Boots, for example, goes next. Minecraft is set to get this style of open narrative storytelling as well. 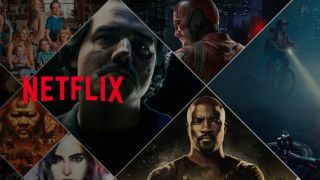 It’s one step away from really gamifying Netflix – which is why rumors of Netflix actually offering games in the near future refuse to die. Picture quality is no game, though, and that's an area in which Netflix, and its biggest rival, Amazon Prime, are excelling. Both adopted 4K early, and now are adding HDR to the mix wherever they can – that latter technology essentially makes things brighter and clearer, and is arguably more important than the amount of pixels you squeeze onto the screen. There’s a rumor, however, that Netflix will shift its HDR content – which is currently bundled into the high tier on the service – to an even higher tier, proving that while innovation can be fantastic, it can also be another reason for providers to hike their prices.